A classic cut flower, gladiolus produces tall flower spikes adorned with large, showy flowers. Often relegated to the cutting garden, gladiolus also suits the back of the border where the tall flowers can complement bushier plants. Gladiolus are available with flowers in a huge range of colors, including apricot, blue, burgundy, pink, gold, red, orange, and white, as well as multicolored varieties. The plants bloom in midsummer; however, you can prolong the bloom period by choosing early, mid, and late season types and staggering planting times. Height ranges from 2 to 6 feet. Select a site with full sun and well-drained soil that is sheltered from strong winds. Plant gladiolus corms in spring after all danger of frost has passed and the soil has warmed. Prepare the garden bed by using a garden fork or tiller to loosen the soil to a depth of 12 to 15 inches, then mix in a 2- to 4-inch layer of compost. Dig a hole about 4 inches deep and set the corm in the hole with the pointed end facing up, cover it with soil, and press firmly. Space corms about 4 to 6 inches apart and water thoroughly. Stake tall varieties at planting time, being careful not to damage corms when installing stakes. 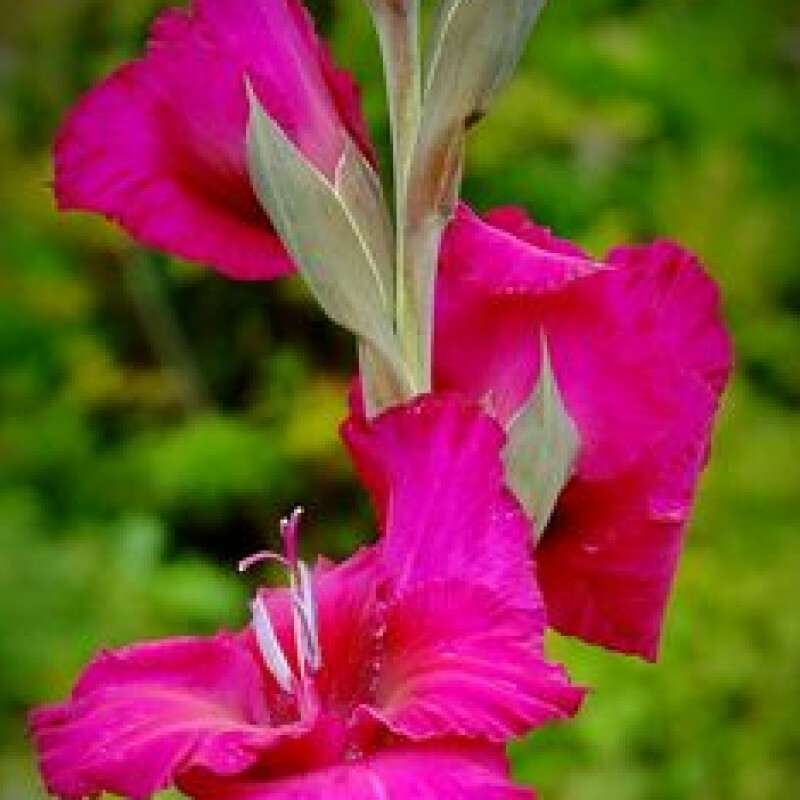 Apply a 2- to 4-inch layer of mulch around gladiolus to retain moisture and control weeds. Water plants during the summer if rainfall is less than 1 inch per week. Remove individual flowers as they fade, and cut back flower stalks once all flowers have gone by. Leave foliage intact to mature and rejuvenate the corm for next year. In zones 7 and 8, mulch beds with a layer of hay or straw for winter protection. In zones 7 and colder, corms should be dug before the first frost. Remove excess soil, cut the stalks to within an inch of the corms, and let them cure for 1 to 2 weeks in a warm, airy location. Then remove and discard the oldest bottom corms and store the large, new corms in plastic mesh bags in a well-ventilated, 35- to 45-degree F room. Replant in spring.